One thing we know about bodybuilding is that it is not just about what you do in the gym, but it is a combination of a number of things. Building muscle is 20% the workouts you do and 80% what you eat. However, it is 100% mental: if your brain is not healthy, your body will not follow. It almost can’t. This means that to get yourself ready for bodybuilding, you need to get your brain in shape first. How do you do that though? It’s not like you can go in for “brain day” and then be sore for the next couple of days. There are no “hot brain” yoga sessions. Instead, you have to exercise your brain in other ways. Once we have been working in the same job for a while and have things down to a routine, it is easy to get complacent and really not think about things too much. Even when it comes to working out, sometimes we think we have things down, and we have little left to learn. After all, if what we’re doing works, why fix what is not broken? That could not be further from the truth. As with many other sports, you never truly become a master. The more you learn, the more you know there is to learn. That means that reading and studying should be a regular part of your routine. Whether that is studying the science of nutrition and keeping up with the latest developments or even just reading the latest bodybuilding magazines for the newest techniques in the gym, studying the sport you are in will only make you better, and the activity will make your brain stronger. Want to get really good at something? Teach it to others for a while, from beginners who are just getting started to those who are up and comers and need some coaching to improve even more. Thanks to technology, there are a number of ways you can do this but having to analyze something and break it down into something you can show others really deepens your skill level. You can teach classes in person or online. You can blog, either for other muscle and fitness blogs or by starting your own blog and website. Of course, this will require some work on your part, but if you have your own domain name, have set up hosting, and have designed an effective site, you can control the message and host your own classes online, post videos, and create other compelling blog content that you own. Whatever method you use, if you are writing about your sport and teaching it, you will see vast improvements. Watching others and critiquing techniques, talking nutrition, and even discussing mental fitness makes you examine your own techniques and nutrition. Sure, doing the daily crossword or a sudoku or two does not seem like much, and chess does not seem like a game for the average bodybuilder. However, they can all have a huge effect on your brain and your willpower. Puzzles teach you to focus and think critically, something essential to bodybuilding. Think of it this way. Your brain is where your willpower, focus, and determination originate, and we know that willpower is finite. There is only so much of it in your tank, and once it is empty your willpower will be faint until you replenish it somehow. Solving puzzles and thinking critically helps build the capacity of the willpower tank in your brain. Deliberately engaging in brain games is another essential to successful bodybuilding. 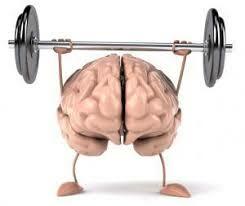 Strong brains equal strong bodies. It may sound counterintuitive, but strengthening your brain also means emptying it from time to time, and that is what meditation helps you do. Thanks to technology, you don’t have to go to a special place to meditate, but you can engage in guided meditation nearly anywhere using apps on your phone or tablet. If you have a virtual reality headset (VR) you can immerse yourself even deeper in mediation and even use image guided meditation, chants, and music to clear your mind and make it stronger. It can’t be emphasized enough that a healthy brain equals a healthy body. Yes, your diet might be working for your body, but what about your brain? Things like nuts, certain fruits, veggies like kale and spinach, and even caffeine in moderation help your brain function at its best. What you eat not only matters to your muscle tone, but to the strength and ability of your mind as well. The right foods in the right proportions will help keep both your body and brain functioning at optimal levels.